We craft bedding in-house to eliminate the middle man and deliver exceptional results. Getting the finishing touches for your master bedroom, guest bedroom, or children’s bedrooms isn’t as challenging as you might think. Here at Wolfgang Interiors – Furniture, Draperies & Design, our in-house custom window treatments and bedding, along with free design advice at our store during this process, give you the opportunity to tie everything together for stunning results. Our talents and abilities cover a broad spectrum, and our styles range from traditional to contemporary so you can get the comforters, pillows, and coverlets you need to make your bedrooms beautiful. We have a wide selection of fabrics available, so in addition to beauty, your bedding can also be crafted to be as functional as you would like it to be. Our passion is to create the environment that achieves the objective you have in mind so your mood when you walk in the room is exactly what you expect. We have more than 20 years of experience in interior design, and we are committed to your complete satisfaction. We will go out of our way to make sure you are happy with the results and creating bedding in-house is one of the ways we do that. 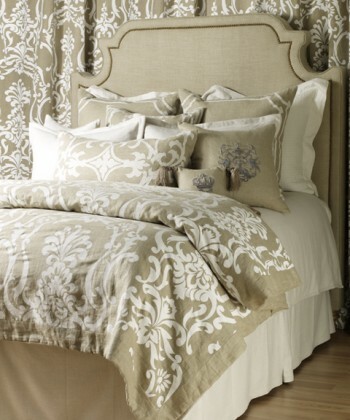 We select the fabrics and fabricate your bedding rather than outsource it like many interior design firms do. You’ll enjoy an exceptional result at a lower cost because we’ve eliminated the middle man. If you have any questions about bedding or any of the products and services we can provide to enhance your lifestyle and your Knoxville, Tennessee home, don’t hesitate to contact us. We are happy to meet with you to discuss what it would take to make your bedroom the oasis you deserve.